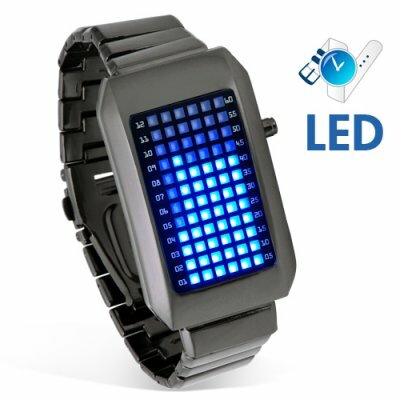 Successfully Added Zero Kelvin - Japanese Style Blue LED Watch (10-Pack) to your Shopping Cart. Up until now, timepieces were stuck in boring old analog or digital mode. But times they are a changing! Say hello to the Zero Kelvin, a blue LED watch from the future which articulates the essence of cool by revolutionizing how we tell time. You mean this watch really tells the time? Yes. Even though The Zero Kelvin embodies apex style and vanguard design with its mesmerizing blue LEDs encased in carbonate hues (like magnetized pulsars in an swirling ocean of black matter), this blue LED watch does in fact tell the time and does so really efficiently too! Tap the display button on the right side of the timepiece and watch the screen light up. There are 72 blue LED lights on the watch face. The first 12 LED lights display the hour. The other 60 LED lights display minutes. How's that for intuitiveness! Seductive to behold, this blue LED watch looks like it just stepped out of The Matrix or Terminator. Make no mistake about it though. You needn't be the One or a Cyborg sent back through time to wear this watch. In fact this watch is perfect for your average physicist, hacker, Trekkie, uber geek, pro blogger, or anybody who is a somebody. Just google "Japanese LED Watch" to see how much these timepieces sell for online. Notice how they normally retail for close to 10x the price we're selling them for. Even if you don't intend on buying one for yourself, stock your online or retail store with these headturning watches to lock in some amazing profits! Brought to you by the leader in direct from China wholesale electronics - Chinavasion. Why is this watch called The Zero Kelvin?